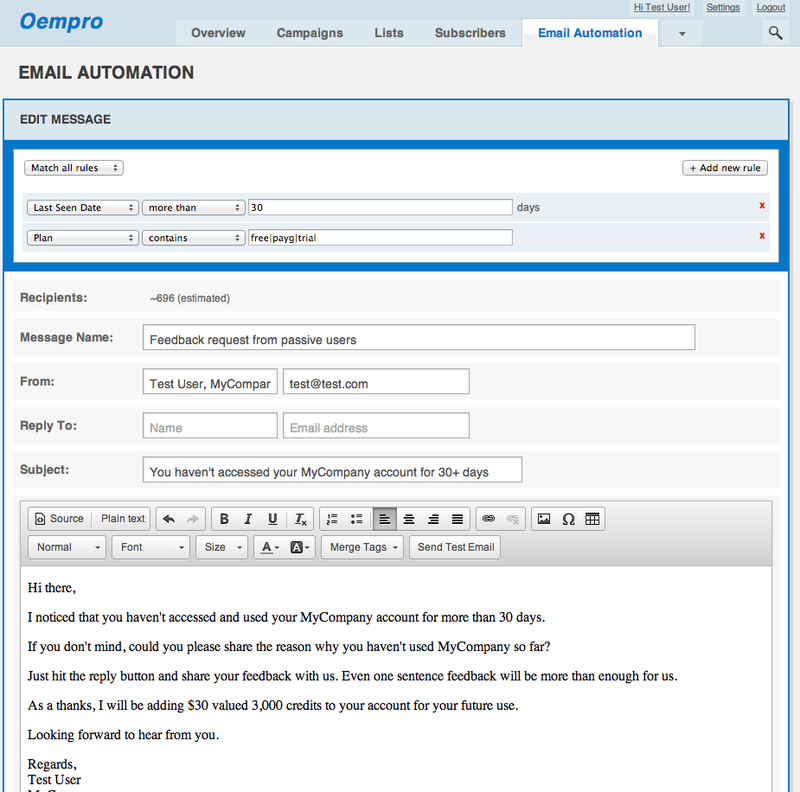 The Email Automation plugin will be available for purchase and download on our coming soon plugin marketplace. 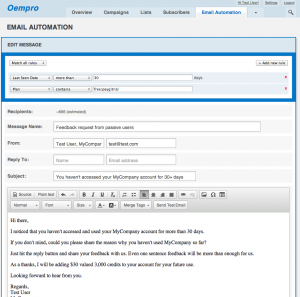 Each purchased Email Automation plugin will be valid for one Oempro license only. Email Automation plugin license fee will be $240 USD, one-time payment. We are planning to run a one-week introductory discount to our existing Oempro customers. We will announce details soon. 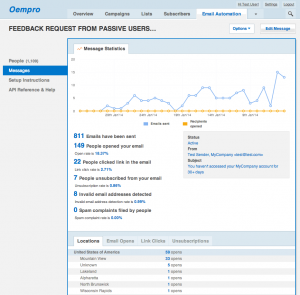 The release date of our Email Automation plugin is 10th February 2014. With the release of our Email Automation plugin, we will also release a plugin development framework to encourage third party developers develop their own plugins and distribute through our plugin marketplace to our 15,000+ customers all around the world. To get notified about the plugin release and special discount, subscribe to our mail list now. Hi, really great to know that the final release is next monday. Question: The automation plugin only allow to create text plain messages or emails? It’s not possible to create real emails using the standard email builder? Felipe, you can create your automated emails in plain, HTML or in both formats. For the mixmind IP geolocation database, it’s possible to use the Downloadable Database to avid higher monthly costs? Any way to implement this? There’s any way to use GeoLite Developer’s Package which is free but less accurate and if we want, move to the web service or the downloable database and install on our server? Email Automation will support MaxMind’s IP city geo-location database for the beginning. We will consider supporting different databases in the future. Yes, the email automation plugin will support maxmind’s downloadable IP geolocation database for the beginning. We will cover other databases in coming updates. This will also be a backend for Oempro v5′s geo-location features. Will v5 be free for existing OEM pro owners? Hi Jeff, if you have active service subscription, yes! If your service subscription has expired, simply login to your client area and extend it. You will get all minor and major updates, including v5 release for free for the following 12 months. Its Been monday 10th feb Today..
It’s Alive now.. Nice plugin Store you have there!! Are we suppose to wait V 4.6.2 to be able to use it? 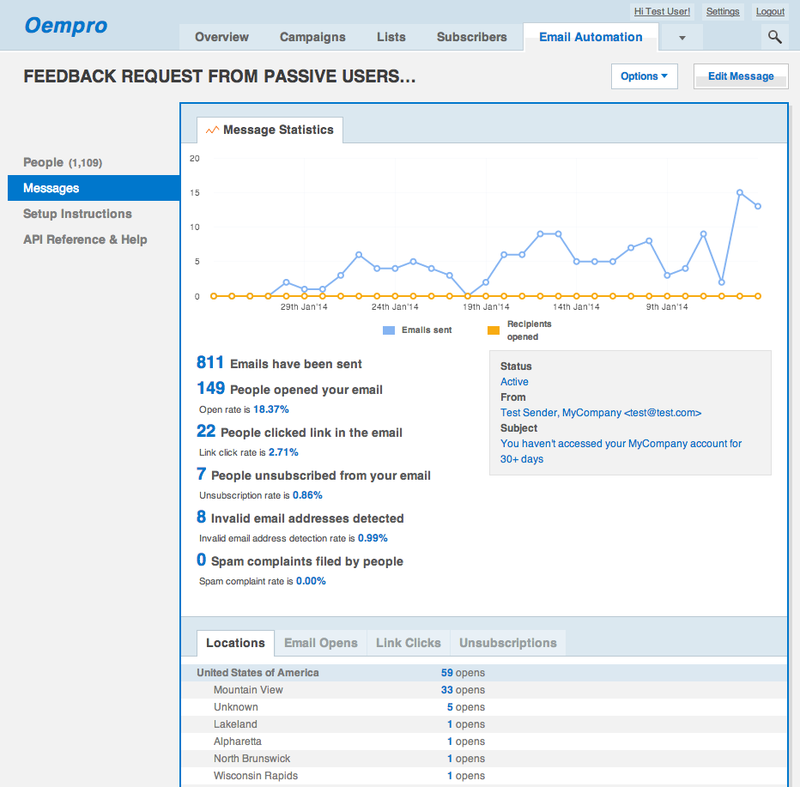 Hi Octa, we are going to release Oempro v4.6.2 in a few hours, stay tuned. When the plugin development framework will be release and where? Felipe, the plugin framework and detailed plugin development manual will be released later this week. Compliments for the new plug in area. Why does the new plugin pnly send via Mailgun and not via a local mta? Special partnership? Thanks Luca. We have no relationship with Mailgun in anyway. We are not affiliated as well. Mailgun takes away all technical hassles which most of our customers have when sending emails, that’s why we have decided to go with Mailgun for the beginning. Based on requests coming from our users, we will consider adding more sending method options such as Mailjet, Amazon SES, Mandrill, Postmark, SenderSuite and other third party MTAs such as local ones. I see, I would suggest to consider also Madrill. Lots features and theirs servers are spread around the world that means quite low ping also for customer, leaving in Europe. Hi Luca, yes, this is just the beginning. We will start supporting Mandrill, SMTP.com and other SMTP supporting MTAs soon. does future update of this plugin will need upgrade cost? Minor updates (ex: 1.x.x) will be life-time free. Major updates (v2, v3, etc.) will be $49 one-time payment.